I spent a rich and meaningful afternoon reading poems with fellow Pacific University Alumni: Kathryn Belsey, Michelle Bitting, Jonathan Harris, and George Wallace--as well as eminent faculty member David St. John. The Ruskin Art Club played host, thanks to the ever-gracious Elena Karina Byrne, to this reunion of sorts. Afterward I heard audience members remark that they felt the variety and quality of the readings gave testament to the strength of Pacific's writing program. David St. John kindly remarked that, to him, the real secret of teaching is that one actually gets back, through the students, so much more than one gives. It was an afternoon full of generosity and goodwill--not to mention outstanding poetry. I also took this occasion to debut my new limited-edition broadside of the poem "Recipe for the Broken." 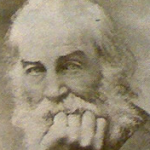 The poem was first published in “Walt’s Corner” of The Long Islander, the newspaper founded by Walt Whitman in 1838. Fittingly, the column is now curated by George Wallace. The poem and background image are printed on sturdy 8.5″ x 11″ paper as part of The Broadsider Volume 2, Series 12 (Poor Souls Press 2010), conceived and created by Paul Fericano. A limited quantity of hand-numbered and signed prints are now available for sale on this website. Categories: Community, MFA, Poetry, Publications, and Readings. Tags: Broadside and The Ruskin Art Club. Poets: Elena Karina Byrne, Jonathan Harris, and Kathryn Belsey.